Fly high as Princess Leia in 20 new levels. 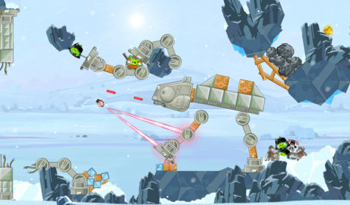 If you happen to be a fan of both the Angry Birds and Star Wars franchises, there's a good chance you've spent some time with developer Rovio's latest mobile hit. But if you've already mastered the first two available worlds - Tatooine and the Death Star - you'll be happy to hear that the first level update is now live, adding Hoth to the list of playable planets. Like the previous level sets, Hoth features a ton of familiar Star Wars enemies and structures, including evil pigs in Snowtrooper garb and even probe droids. But fear not, it's not just new enemies being introduced in the update; A new bird modeled after Princess Leia also joins the ranks. This tiny pink avian warrior is capable of pulling down buildings and throwing enemy pigs high into the sky which, put simply, is quite satisfying. The Hoth update is a free download, but only adds half of the planet's 40 total levels. The rest of the frozen planet will be unlocked in a future update.